Dance students at North Port High School recently experienced an exciting opportunity to learn more about the history of ballet and modern dance through a lecture presented by Robert de Warren under the auspices of the Sarasota International Dance Festival (SIDAF). 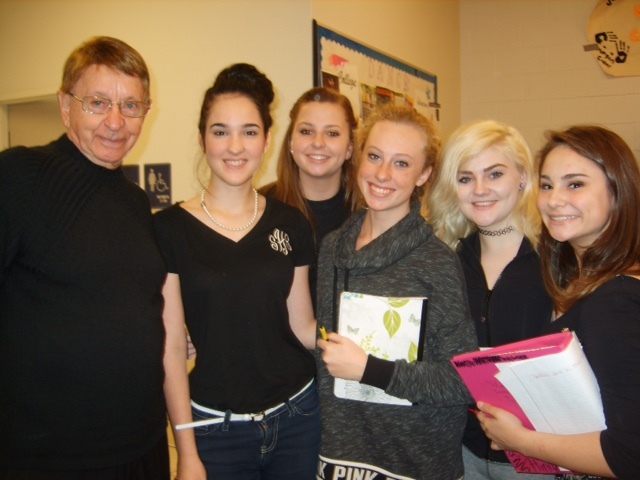 Robert de Warren and North Port High School dance students. Mr. de Warren is the founder of the Sarasota International Dance Festival (SIDAF), which presented The Carreño Dance Festival, bringing to Sarasota prominent guest artists, faculty, and students from the United States and several foreign countries. He recently produced a critically acclaimed performance of LIFTED, which showcased the best exponents of current contemporary dance from Europe and North/South America. In his position as Artistic Director of the Sarasota Ballet Company for more than a dozen years, Mr. de Warren founded the Sarasota Ballet School. During his distinguished career, he has directed several ballet companies abroad, as well as being involved as a dancer, choreographer, producer, and costume and set designer. North Port High School dance instructors, Michelle Slay and Heather Nelson, prepared students in advance with pre-lecture background information. Mr. de Warren’s presentation focused on highlights of 300 years of classical ballet, and the origins and development of modern American Dance. Clips from a wide selection of films depicting present and past stars of the world of dance enhanced the presentation. For information on specific lecture topics and the SIDAF Lecture Series, contact Dr. Sherry Lawrence at drslwrence@yahoo.com or 941-685-5400. Blog contributed by: Dr. Sherry Lawrence, Sarasota International Dance Festival Board of Trustees. For more information contact Sherry by email.